To start off, you will need to gain control to the server using FTP Access, unless specified otherwise in the instructions. All of the files that you need will be detailed out as well as what they are used for. The files for ARK are located in the /ShooterGame/Saved directory. The primary save files are found in /ShooterGame/Saved/SavedArkXXXXX/ (where XXXXX is your game server ID). If you have a cluster server, then the *.arkprofile, *.arktribe, and MapName.ark files will be stored in /ShooterGame/Saved/SavedArkXXXXXTransfer/ . These are the individual character profiles that contain data such as level, engrams learned, stats, and items. This is the information for each ARK tribe. This is the main map file that contains the map, structures, and tamed dino data. The saved backups for ARK files are written in a specific file format: MapName_Day.Month.Year_Hour.Minute.Second.ark in UTC time. (Eastern+5 hours. Pacific+8 hours). Unfortunately, due to restrictions placed by Sony, access to the server files and saved game data for PS4 servers are strictly prohibited. For Atlas, there are multiple files that need to be copied down. The file structure is very similar to both ARK and Dark and Light. This file contains all of player and company data. This is the layout information for the server's grid and island data. Excluding this file will cause your map to be reverted to a default. This folder contains the map images that you see when holding up your map and compass in game. Not including these files may have the map blank when you view it. Similar to ARK and DNL, this contains configuration data such as leveling, attribute, etc. data. 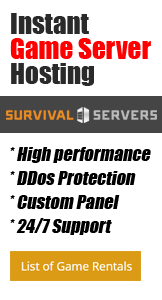 This contains simple server settings, such as difficulty, various multipliers for harvesting, building, day/night, and building decay/destruction settings. This file contains leveling data, engrams/learnable abilities, dino/animal levels, and changes to stats such as HP, Stamina, Food/Water, etc. Most custom launch parameters will go here. Unlike ARK servers, Citadel servers contain the major server settings in one file, however the backups are separated into separate subfolders. The settings for a Citadel server are all stored in the Game.ini file. This file is the world saved data for the Citadel server. These folders contain saved game backups based on the frequency chosen. These folders can be labeled as "DayOfWeek_2-Wednesday" or "WeekOfMonth_3". This is the saved data for all of the server, including characters, world, and building data. /ConanSandbox/Saved/game_backup_X.db where X is a number. These files are named with the most recent update being the smallest number. We would recommend downloading game_backup_1.db, game_backup_5.db, and game_backup.10.db, just in case there are corruption issues with the most recent data. Overtime, the backups will be overwritten with new backups. Unlike ARK's separation of server settings between two files, server settings are found in this file. While similar to ARK's file structure, the major difference is the lack of 'XXXXX' on the "SavedDnL" server folder. All of the data stored in the files is almost identical to ARK, with the exception of camps, which are stored in their own files. (*.dnlcamp and *.campbak) The backup file nomenclature is identical to ARK, with all times in UTC. Both Game.ini and GameUserSettings.ini can be found in the same location as ARK. Profile file info. This contains learned skills, inventory, and player levels. This is the main saved data for the world, containing any tamed animals or buildings. For Eco servers, there are two primary folders that should be downloaded. This folder contains all of the configuration settings to setup the server, along with permissions, laws, etc. This folder contains the saved data and player progression for the server. Unlike ARK, PixARK's file structure is split up between four main ones. This is the main server world file and contains data such as buildings and tamed dinos. This folder contains the data for the tribe info, as well as player permissions. Player profiles and their backups are stored in this folder. These files contain engram, levels, stat allocations, and inventory data. Unlike other games, Rend saved files all use the *.sav extension. The contents of the main *.sav files are unclear at this time, however we would strongly suggest to download the most recent versions of the major three, outlined below. This file most likely contains persistent player profiles. Server data for Rust is wiped out on the first Thursday of every month. However, backup data can be copied down for safe keeping. There is a small breakdown in the "server" folder, which will be highlighted below. This contains all of the saved data for the server, including world and player blueprints. All world data are files with the *.sav format. This is the file that contains all of the learned blueprints. If you want to wipe out your server data, but keep your blueprints, download this file. This main folder, and all subsequent ones inside, contain the player data excluding blueprints. If you want users to start over, but retain all blueprints, then ignore this folder. For 7D2D, you will want to copy both the serverconfig.xml file, as well as the entire /Saves folder found at the top directory. This contains all of the settings for the server, from blood moon frequency, server seed and map size (important for the save folder), and other various settings. To use the same saved game data, copy this file down, otherwise a new randomly generated world may be created and you will lose progress. NOTE: If using the Navezgane map, saved data will not be lost when excluding the serverconfig.xml file. Depending upon if you are using the default Navezgane or a randomly generated world, the folder names in this folder will vary. The serveradmin.xml file contains a list of all players who are allowed to have admin / creative privileges, as well as which commands they may use. Space Engineers contains all saved data in the Instance folder, including the configuration files, world data, and saved backups. /Instance/Saves/[WorldName] where [WorldName] is the value from the World Name field from the control panel. This folder contains the saved data for the specific world, including available backups.